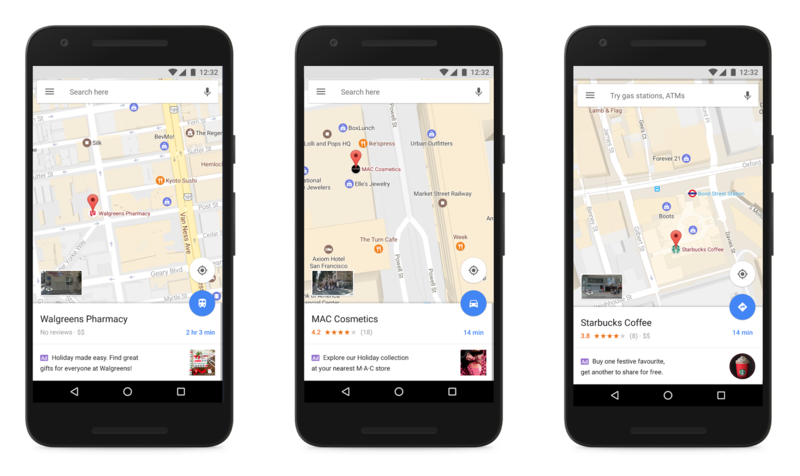 This year, a number of brands are testing Promoted Places in Google Maps to showcase special offers and announcements to drive more foot traffic to their stores. Some users have started seeing a limited test of Promoted Places in the Google Maps for Android app. It integrates seamlessly with the browsing experience, where places of interest are visually marked with icons to help users orient themselves and explore the world around them. With Promoted Places, advertisers can improve awareness for their stores by branding their location icons with their logo. Clicks on a business’s logo will reveal promotions such as in-store sales or new products and services to help consumers decide where to go. They can also view the business’s place page to see store hours, check live updates to Popular Times, get directions, and more. "With Promoted Places, we can enhance our presence on Google Maps and give users a glimpse of our brand and coffeehouses before they even get there. Having our logo on the map helps our locations jump out and promoting our favourite menu items gives people a reason to choose us." This holiday season, Promoted Places will help businesses stand out to busy shoppers in the moments they’re figuring out where to go. 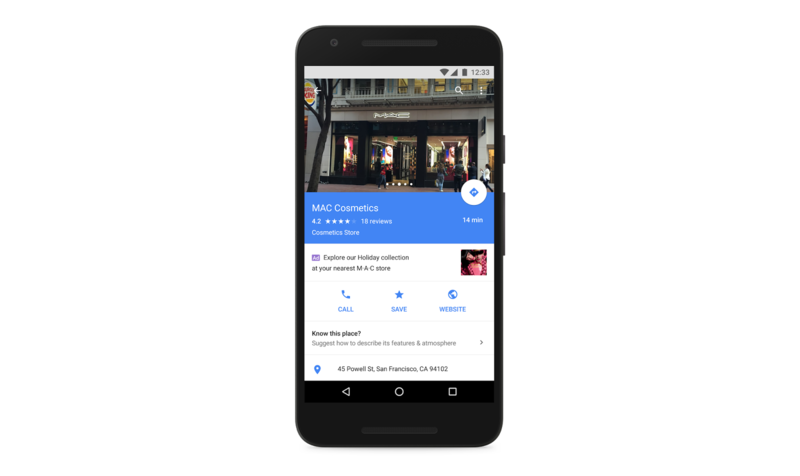 We’re excited to test new experiences that help consumers discover nearby sales and promotions and allow businesses to reach more people through Google Maps. During the busy holiday season, on-the-go shoppers are using their smartphones to find the perfect stocking stuffers, festive decor and gifts for loved ones. In fact, 70% of smartphone users who bought something in a store first turned to their devices for information relevant to that purchase. 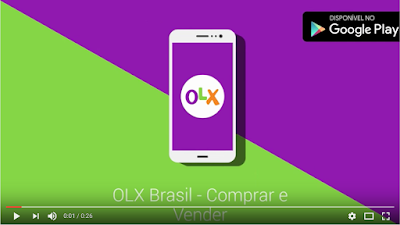 One in four of them also used a map through a web browser or an app before making the purchase.1 This year, a number of brands are testing Promoted Places in Google Maps to showcase special offers and announcements to drive more foot traffic to their stores. to learn how to set up new scripts for your video campaigns. If you were wishing for an easier way to manage your video ad campaigns in AdWords this holiday season, the AdWords product team has the perfect gift picked out. 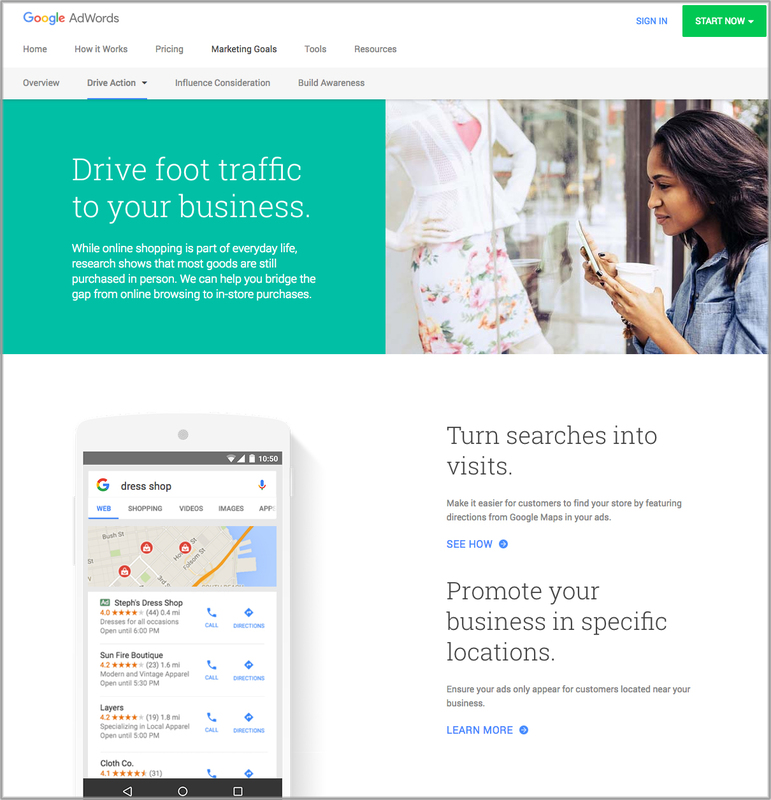 Today we’re announcing AdWords scripts support for TrueView and six-second bumper ads. This means for the first time ever, you’ll be able to programmatically create and manage video ad groups, targeting and other campaign features alongside your Search, Display and Shopping campaigns. The new script support is available for standard YouTube ad campaign types like TrueView in-stream, TrueView discovery and bumper ads – and we’re hoping to eventually expand functionality to additional campaign types like shopping. Making this tool available for video means multi-step campaign management tasks will be much easier – like scheduling regular reporting, creating new campaigns en masse and even automating adjustments to campaigns based on real-time factors, like the weather. To get started, check out the Help Center article to learn how to set up new scripts for your video campaigns. Passwords have historically been the gateway to accounts; however we’ve shown that some of the most common passwords and security questions are easy to guess, which leaves accounts potentially vulnerable to hijackers. Keeping our users and partners secure is a top priority for us and we continue to work hard to help you keep the bad guys out. 2-Step Verification (2SV) is one of the best ways to protect your account from hackers. 2SV combines both ‘something you know’ (like a password) and ‘something you have’ (like your phone or security key). Think of it like withdrawing money from an ATM/cash machine, where you need both your PIN and your bank card. Millions of businesses use our advertising service, Google AdWords to display their businesses in Search and improve their reach globally. As part of our commitment to our AdWords customers and to demonstrate how easy it is to adopt better security standards, we distributed 2SV security keys to 60 of our largest ad agencies across four countries (UK, Spain, USA, Mexico). The agencies found the keys to be a useful security feature and have implemented 2SV into everyday practices. Here’s the story of two UK ad agencies that piloted this program. Jellyfish is a full service digital marketing agency with offices in the UK, US and South Africa, and with over 250 staff, Jellyfish prides itself on its dynamic approach—responding to clients’ needs in an ever-changing digital landscape. Ranked the number one digital agency in the UK by The Drum Digital Elite in 2015, Jellyfish boasts an influential client roster including: Nestle, Motors.co.uk, Gatwick Airport, National Geographic, Zipcar etc. The introduction of the security keys has had a real impact on the Jellyfish team. 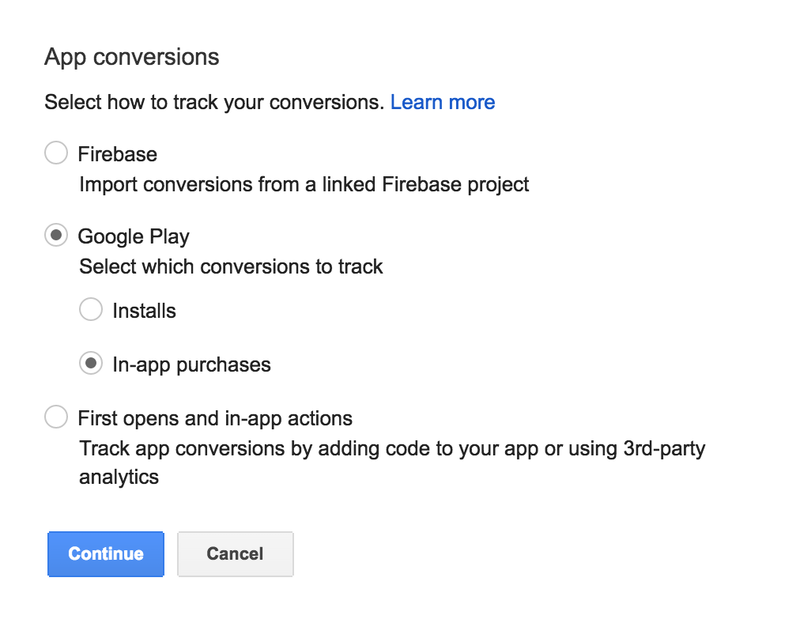 “Having already rolled the 2-step verification across every single one of our AdWords logins, we already knew the great benefits of using features like the Authenticator app. Having a physical key that we could link to multiple AdWords accounts, even in the case of us not having our phones, helps us run the account easier,” says Hartley. “The security key emphasises deeper security culture and because it’s a physical device, our staff members are always conscious of it,” added Mohammed. Jellyfish has rolled out the security keys to all team members in the UK and South Africa, with plans to roll it out across the US office. “When winning new business, I’ve no doubt the keys show just how seriously we take security and therefore the careful management of their accounts and data – it sets us apart from other agencies in the market,” says Hartley. Based in Regent’s Place, the thriving heart of London’s commercial sector, iProspect is a global digital marketing agency, driving digital performance for some of the world’s largest advertisers across over 50 markets. Its heritage lies in paid search, with 100% of its UK clients taking advantage of search and display opportunities through the Adwords platform. “Introduction of the security keys has been a valued initiative. Even though we anticipate a future with more sophisticated phishing attempts and aggressive tactics to compromise accounts, we are confident that together with Google, we are up to the task of ensuring the safety of our clients’ accounts,” says Abbott. You can find out more about Google’s 2SV process here. And if you are an AdWords user, you can purchase security keys for your account from several manufacturers such as Yubico or buy them on Amazon. in moving them along the path to a purchase. Remarketing lists for search ads (RLSA) and Customer Match can help you do that by customizing your campaigns for people who’ve previously interacted with your business. However, getting started can be time-consuming, especially if you have a lot of ad groups. To make it easier for you to manage your audience lists at scale, you can now apply them at the campaign level. Campaign-level audience lists also make it easy to measure and change your bid adjustments. Instead of trying to change your bid adjustments for each individual ad group, you can confidently optimize at the campaign level where you’re more likely to have enough data to make an informed decision. Learn more audience bid adjustment best practices here. With campaign-level search audiences, you now have more flexibility than ever in how to engage with your customers. Learn more about using campaign-level audiences in the Help Center, and read our best practices guide to learn how you can reach the right audience with a message that resonates. Reaching your most valuable and engaged customers at the moment they’re ready to act is critical in moving them along the path to a purchase. Remarketing lists for search ads (RLSA) and Customer Match can help you do that by customizing your campaigns for people who’ve previously interacted with your business. However, getting started can be time-consuming, especially if you have a lot of ad groups. To make it easier for you to manage your audience lists at scale, you can now apply them at the campaign level. 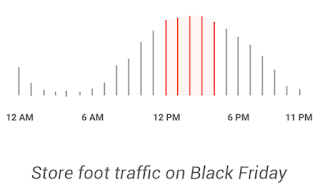 we covered how mobile has changed shopping behavior during Black Friday weekend. But its effects don’t stop there. Mobile is making it easier to find sales and great deals, encouraging shoppers to browse during traditionally lower traffic seasons; in fact, 22% more mobile shoppers visited retailers via Google in the January after the holiday season, than in the October before.1 For certain categories, like Furniture or Home & Garden, January visits increased up to 39% over their October levels.2 Optimize your strategy to keep your Google Shopping lights on for these savvy shoppers and start the year off with a bang. There are five categories where retailers saw more traffic coming from Google in January of 2016 than in October 2015. If you sell products in these categories, use the following best practices to expand your reach to shoppers. 1. Use click share to drive more engagement. Products in top positions may see better engagement from shoppers, especially on mobile. The following benchmarks highlight the mobile click share by category you’ll need to be competitive in reaching the top positions. To grow your click share, start by increasing your bids and ad relevance for your priority products. 2. Create a strategic seasonal campaign. Separate strategic products or items on sale with a separate campaign with a higher campaign priority. A separate campaign enables more flexibility in managing bids and budgets for these products without affecting the rest of your campaigns. 3. Use custom labels to create seasonal product groups. If you plan to sell high-value products in a given category, like winter accessories for vehicles and parts, use custom labels to create a segmented product group in your campaign. This way, you can specifically adjust the bids for winter accessories and then monitor the click share to reach top positions in Google Shopping results. 4. Remarket your products to previous shoppers. Increase the visibility of your products to shoppers who visited your site during the holidays but didn’t convert. Create a remarketing list of previous visitors who may have abandoned their carts at checkout. Chances are, these shoppers are still looking for the best deal available. If you’re having a clearance sale, highlight your lower prices to these shoppers as they continue to browse. Whether it’s to gear up for the winter or take advantage of clearance sales, these shoppers were eager to continue shopping online last January. Continue adjusting budgets, especially in categories that saw increased traffic last year to reach these shoppers in the New Year. For more best practices on driving a successful holiday season, visit the help center. 1. Google Internal Data aggregate mobile traffic October 2015 and January 2016, US. 2. Google Internal Data aggregate traffic by category October 2015 and January 2016, US. 3. Google Internal Data October 13 to October 20, 2016 average click share for overall mobile campaign or product groups with a selection of products in top-level Shopping categories, Global. 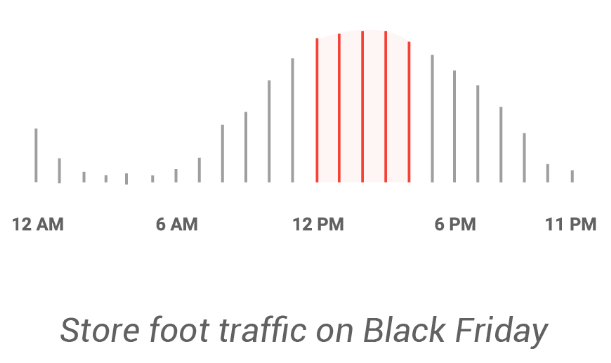 Last week we covered how mobile has changed shopping behavior during Black Friday weekend. But its effects don’t stop there. Mobile is making it easier to find sales and great deals, encouraging shoppers to browse during traditionally lower traffic seasons; in fact, 22% more mobile shoppers visited retailers via Google in the January after the holiday season, than in the October before.1 For certain categories, like Furniture or Home & Garden, January visits increased up to 39% over their October levels.2 Optimize your strategy to keep your Google Shopping lights on for these savvy shoppers and start the year off with a bang. supershoppers overnight. As they go shopping this holiday season, it’s more important than ever to connect with your most valuable customers at the exact moment they’re looking for a gift. Customer Match makes this connection easy by helping you to engage these valuable holiday customers as they’re searching on Google, watching videos on YouTube, and checking promotions on Gmail. Starting today, we’re rolling out an easier way to manage your customer lists, giving you more flexibility in reaching your customers during the busy holiday season. Let’s say that you manage marketing for an online clothing store, and you’re interested in connecting with your active newsletter subscribers. To make it easy for you to keep this customer list up to date, you can now add and remove specific email addresses, or even replace your entire list without having to create a new one. Learn more in the Help Center. TurboTax created customized ads and landing pages to ease returning customers into the tax-filing process, decreasing its cost per conversion by 31% in the process. Guitar Center made product-specific customer lists and increased CTR by 60%. The Children’s Place re-engaged back-to-school shoppers with customized ads, increasing its return on investment (ROI) by 287%. One Click Ventures cross-sold eyewear across multiple websites and saw a 412% increase in conversion rate. Wine Enthusiast Companies combined Customer Match and RLSA to sell wine merchandise to its customer base, delivering a 3x higher ROI. To save you time before the holidays, we created an upload service to help you get started with Customer Match. We’ve partnered with Merkle, Sailthru, LiveRamp, PMG, Neustar, Epsilon and others to make the upload process turnkey. Some of these partners can even help you expand your customer lists and match rates, too. We’ve also partnered with Salesforce and Adobe, who have made it easy for you to upload your customer lists directly from within their customer relationship management platforms. If you’d like to learn more about these services, contact your Google account team. Understanding your customers and being present in the moments that matter to them is critical. Marketers who adjust their plans accordingly with tools like Customer Match will be positioned for a happy holiday season– and a successful 2017. Consumer expectations are higher than ever before. And thanks to mobile, your customers are connected, informed and savvy– they’re becoming supershoppers overnight. As they go shopping this holiday season, it’s more important than ever to connect with your most valuable customers at the exact moment they’re looking for a gift. Last year, more than 50% of holiday shoppers said they were open to purchasing from new retailers1. This is especially true online. More than three-quarters of smartphone shoppers who usually go to the same physical stores when they shop for products are very open to new retailers and brands online2. Why? Mobile makes it easy to explore all of your options no matter when or where you’re shopping. In fact, after searching on Google, 76% of mobile shoppers have changed their mind about which retailer or brand to purchase3. It used to be that shoppers would thumb through catalogues or stare longingly at the holiday window displays, but mobile is now the super shopper’s go-to source for inspiration. Sixty-four percent of smartphone shoppers turn to mobile search for ideas about what to buy before heading into store4. And 1 in 4 mobile video viewers in the U.S. have visited YouTube for help with a purchase decision while they were at a store or visiting a store's website5. But shoppers aren’t only making purchase decisions, they’re discovering new brands and products along the way: more than half of smartphone users have discovered a new company or product when conducting a search on their phones6. In July we learned that shoppers are on the quest for the best - and this still rings true more than ever today. Last holiday, mobile searches related to “best gift” grew 70% year over year while mobile searches related to cheap or inexpensive gifts grew about 35%7. They’re also willing to do the research to the make the best decision: on YouTube, mobile watch time for product review videos has grown 60% year over year8. But supershoppers don’t only want the best - they want personalized, unique, cool gifts. Mobile searches related to “unique gifts” grew more than 65% while mobile searches related to “cool gifts” grew a whopping 80%9. Although more and more people are willing to buy on mobile, we know that mobile is still used predominantly as a door to the store. In fact, 76% of people who search for something nearby on their smartphone visit a related business within a day, and 28% of those searches result in a purchase10. Once they’re inside your store, they expect the experience to be a seamless one: more than 40% of smartphone shoppers want retailers to automatically surface relevant information such as the location of the item in the store, a special deal or related products11. Supershoppers live up to their name as the holiday season progresses. From November through mid-December we see online conversion rates increase across devices. Last year, on mobile alone, they jumped 30% on Black Friday and 50% on Cyber Monday when compared to November 112. Get your holiday campaigns in shape: Use a combination of search and video ads to reach shoppers across all their digital touchpoints. Ensure your products stand out by reading our list of optimization do’s and don’ts as well as our best practices for TrueView video ads. Be Present on Mobile: use mobile bid adjustments to ensure your brand is present no matter when people are shopping. For search campaigns, you can send mobile users to the right pages on your site by using mobile URLs in expanded text ads. Manage Your Bids Efficiently and Effectively: Use Smart Bidding in AdWords or DoubleClick Search to maximize your performance. Improve your bidding for sales and promotions by using Business Events in DoubleClick Search. Bring your Brand into the Consideration Set: as shoppers are more open to new brands online, help shoppers discover your brand and products through category keywords and audience targeting formats like TrueView for shopping. 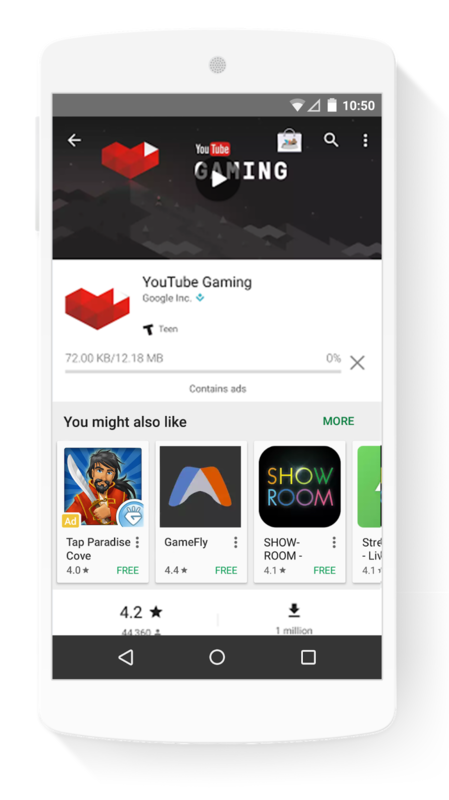 You can use TrueView video discovery ads to target YouTube search pages relevant for your brand. Don’t Miss Out on People Who are Willing to Buy Your Products: Monitor your budgets and review your click-share daily to make sure you’re not losing out on shoppers ready to buy. Increase bids and budgets as conversion rates rise, and don’t forget to keep the lights on even after the holiday season ends! Finally, don't forget to use store visits or store sales to make sure offline sales are accounted for. 6. Google/Ipsos, "Consumers in the Micro-Moment," Wave 3, U.S., n=1291 online smartphone users 18+, August 2015. 7. Source: Google Search Data, Apparel, Home & garden, Beauty & personal care, Computers & electronics, Gifts, Toys & games, Photo & video, Nov-Dec 2014 vs Nov-Dec 2015, United States. 9. 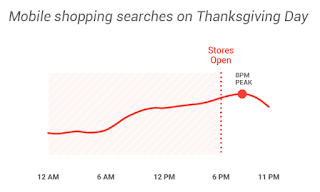 Google Search Data, Apparel, Home & garden, Beauty & personal care, Computers & electronics, Gifts, Toys & games, Photo & video, Nov-Dec 2014 vs Nov-Dec 2015, United States. We all have that friend - the one who somehow knows the latest brands, the season’s must-have products, and where to find the best deals at the snap of a finger. In years past, this friend was an enigma, making us wonder how does he (she?) do it? Today, we can all be that friend. With the ability to instantly discover, research, and purchase, shoppers around the world are more informed and more efficient than ever before - they’ve transformed into supershoppers seemingly overnight. But what defines supershoppers? And what does this mean for retailers trying to win them over this holiday season? Let’s find out.